“I like myself, but people don’t like me. I like the people who like me. No one wants to touch or kiss me, not even my family,” says the 22 years old Fatima Zeynu. Fatima was lively when she spoke and craved for friendship. 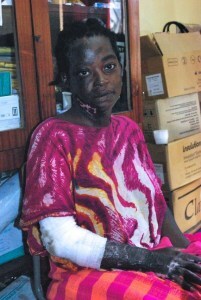 Fatima fell into an open fire due to an epileptic seizure that occurred while cooking over an open fire. Even though her mother removed her immediately from the scene of the accident, the flame has already made the damage burning her face, neck, chest wall, abdomen, front thighs, forearm and hand. Consequentially, her skin shrank up to close the wounds, creating what are known as burn scar contractures and she was subjected to a skin graft. 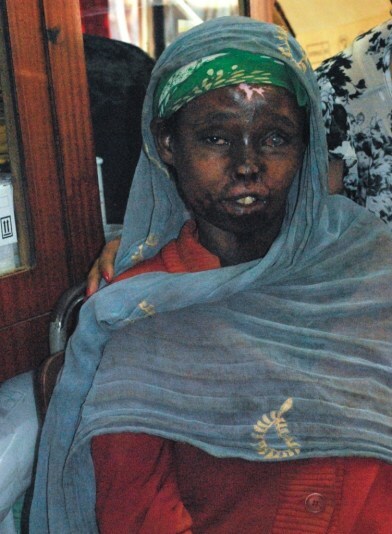 This is one of the multiple post-burn scars that Fatima carries with her. Though Fatima has been on medication for the past eight years, it has done very little to control her seizures. Once every two months, Fatima travels 110km from Bonga to come to Jimma Hospital for her follow-up appointment. This journey is too painful for Fatima; people stare at her scars, bus assistants refuse to take her on the bus more often than not and, worst of all, her parents refuse to accompany her for fear of being associated with her. Such encounters with the members of the society have forced Fatima to believe that she is cursed and has some evil spirit inside her. As a result, she does not want to get married for fear of passing epilepsy on to her children or having a seizure during her pregnancy and hurt the baby. Fatima wishes to be able to work and support herself and spend time with other people who live with epilepsy to share her problems. “This is a punishment from God,” says the 30 years old Kadina Kofto while referring to her epilepsy case. She lived with it without any medication for 20 years. One day, Kadina lost consciousness while baking Injera in an open fire. She fell into the fire which burned 7.5% of her leg, forearm and hands. This is one of the many generalized tonic-clonic seizures that left her with scar contractures and, sometimes, infections. Kadina used to have seizures at least twice a day. But now, she has it less often than before thanks to the anti-epileptic medication. Though she has to travel 21 km from her village, Seka, for a medication refill, she is still hopeful. When asked about her wish “I want to work and support herself and spend time with other people like me” was her response. His peers hit him with sticks and call him names including “here comes the evil spirited one”. A 14-year-old boy with behavioural problems, Edamin grew up deprived of his mother’s love since she left him long ago. “She couldn’t cope with the challenges and the stigma associated with epilepsy” was what her husband told us. His father believes that a good education is a ticket to a bright future for Edamin, but he hasn’t been given the opportunity. Edamin has been in the 2nd grade for the past four years not because he isn’t smart enough to pass, but because his teachers won’t let him progress due to his epilepsy. The father questioned the teachers and reported this to the school, but nothing came out of it. 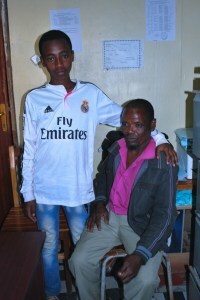 He even tried to register him into a private school, but the school refused to take Edamin. “The bullying in school is unbearable, ” says Edamin. His peers hit him with sticks and call him names including “here comes the evil spirited one.” As a result of all this Edamin now refuses to attend school and this hurts his father deeply. “I don’t want education, but I want to have a job to support myself and my baby”. 16-year-old Zeyneba lives at the Catholic Mission in Jimma. She is not attending school but helps out at the Mission. Zeyneba says “I don’t want education, but I want to have a job to support myself and my baby”. She started having seizures at the age of three. This is her third major burn while making injera. She has previous burns on both her arms and legs. “I feel it before the devil pushes me to fall” is how Zeyneba describes her aura (a sensation where one knows before a seizure occurs). Although she gave birth to a baby girl from her fiancé, he left her after witnessing one of her seizures while pregnant. She was left to work as a maid with several families, but she was sacked from every one of them when her employers witnessed her having a seizure. She does not want to be the recipient of handouts. She believes if she is given continuous medication she will be live a normal life. These are people with epilepsy from the Menit Woreda in Southern Ethiopia and are not on any anti-epileptic medication. They were found begging for food by St. Michael church in a small rural town called Mizan-Aman, Bench-Maji Zone, 561 km away from Addis Ababa. The community believes epilepsy to be an evil spirit as well as contagious which is trying to enter the concerned family. Stigma and exclusion are common features of epilepsy in this community and a major contributor to the burden associated with the condition. Stigma here is based on two myths: that epilepsy is contagious and that it is caused by demonic possession. Belief about possession go across societal boundaries. In most cases, it is not related to the level of education or literacy. Sometimes it’s the most educated people who will tell you that it’s demonic. Aisha is a 40 years old woman who believes that she is possessed by some evil spirit and had never attended a clinic for epileptic treatment before suffering a burn injury.